The Bumbleride Indie stroller, shown here in Ocean and Walnut, the two color options available as part of their Natural Edition, which uses 50% recycled materials in the fabric. 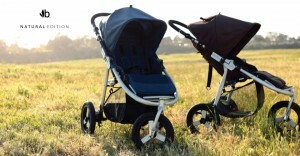 The Bumbleride Indie stroller could very well be called the Nimbleride Indie stroller for its quick and easy handling. That was my first impression after I set it up and took it for its maiden voyage, with my newborn daughter riding in the first class seat. The 12” inflatable tires and rear suspension really smooth out the bumps on non-paved surfaces, while the swiveling front wheel makes maneuvering the stroller amazingly easy–almost effortless–even with one hand. The result is a smooth and enjoyable strolling experience, for baby as well as for the pilot. The rear wheels are easily locked and unlocked by stepping on or lifting up on the brake bar. One quick motion and the brakes are on or off. The front wheel can be locked in place as well for when you’re walking or jogging in a relatively straight line. It has two locked positions: with the wheel facing forward to stretch out the wheelbase for more stability when jogging and with the wheel facing backward to maintain a shorter overall length for walking around the neighborhood or in town. Next to good handling, an equally important quality of any stroller is its ease of folding and unfolding, and the Indie couldn’t be easier. By simply pulling on two release triggers, (conveniently located on the sides of the frame, just below the handle), the top portion of the frame folds forward revealing the carrying handle strap located behind the rear seat. At that point, you simply pull up on the strap and the rest of the frame folds in half. Easy to use locking brackets can then be attached to prevent the stroller from unfolding when carried, and at only 20lbs, carrying the stroller won’t break your back. For a more compact fold, the wheels can be removed without tools. The Indie has a nicely sized storage bin under the seat for blankets, diapers, extra clothes, food, etc. and a small pouch on the canopy for your keys, phone, camera, etc. Additional storage can be attained with the optional snack pack so that your toddler can have his or her own easy access to snacks. Just make sure the snacks are healthy! With the multi-use bar, the Bumbleride Indie is compatible with certain car seats—we use the Chicco Keyfit 30—so it can be used from infancy up to 45 lbs. Other features include an adjustable handle and footrest, an SPF 45 canopy, a five point safety harness with an infant headrest and shoulder harness, a cup holder and a jogging strap. It is available in multiple colors, and as part of their Natural Edition line, it has two options that use 50% recycled exterior fabric and a seating surface made with 50% Bamboo, which offers excellent temperature regulation. The Bumbleride Indie stroller is an all-terrain stroller with the agile handling of an urban jogger. Loaded with features and easy to use, it is a great choice for infants to toddlers up to 45 lbs.